A private eye gets caught in the middle of a Tokyo gang war, when two gun-running yakuza clans are ripped off by a third. 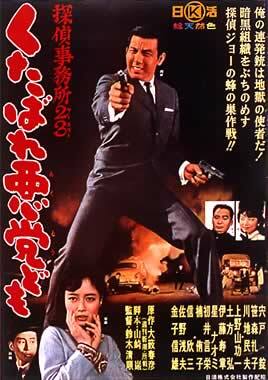 Made by cult director Seijun Suzuki at Nikkatsu in 1963, Detective Bureau 2-3: Go to Hell Bastards! was also his first to feature Jo Shishido in a leading role. Shishido plays investigator Hideo Tajima, the hero from a series of six books by novelist Haruhiko Oyabu, deriving its numerical title from the building location of Tajima’s office door. Clearly intended as the start of a franchise, the film was based on Urban Graveyard, the first book in the series, but as noted by Jasper Sharp in this disc’s liner notes, was retitled for the cinema as something that might also be translated as “Get lost, rascals”. It somehow gained its more lurid, comma-free English title on the international sales circuit. As in the books, Tajima the detective enjoys a special, privileged status: one of the only Japanese civilians authorised to carry a gun. 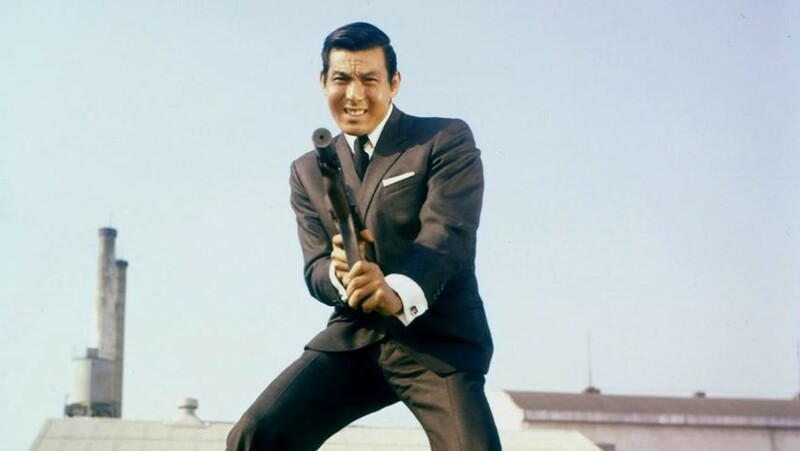 So while he is not quite the “licence to kill” of another film hero whose cinema debut came a year earlier in Doctor No, he is legally permitted to bring hard-boiled action heroics to the Tokyo streets. This, perhaps, helps explain the timing of the Japanese film’s original production, the action pose on the original poster, and the use of its otherwise clumsy numerical designation – like James Bond 007, Tajima is something of a free agent, lurking in an underworld of nightclubs and car-chases, with occasional mass shoot-outs, working alongside but somehow independent from the authorities. Much is made of cooperation between Tajima and the real police, personified by his point of contact, Inspector Kumagai (Nobuo Kaneko). Seijun Suzuki began working for Nikkatsu in 1954, initially as an assistant director. He made his first film as director for the studio in 1956, churning out several movies a year until he was fired after 1967’s Branded to Kill, which studio boss Kyusaku Hori considered incomprehensible. Suzuki’s reputation in the West rests largely on that film and the earlier Tokyo Drifter (1966) for the way in which they transcend unremarkable material with an idiosyncratic and off-kilter visual style. But this film has its problems. The scenes in Tajima’s office, in particular, grind to a standstill thanks to his irritating female secretary and a largely bland male assistant. Nevertheless, in Go to Hell Bastards! Shishido is highly watchable as Tajima. Six months after the release of Go to Hell Bastards!, Nikkatsu followed with Detective Bureau 2-3: A Man Weak to Money and Women, based on books two and three in the series, directed by Nozomu Yanase. Tajima and Inspector Kumagai would return, as would Chiaki (Reiko Sasamori) the frustrated, virginal girlfriend of this film’s villain, given a new chance as Tajima’s assistant. But the cracks were already showing – disappointing box office for the first film led to the second being shot in black and white, rather than colour, and there would be no more. Although Detective Bureau 2-3: Go to Hell Bastards! can be enjoyed as a routine detective programmer, beneath its surface you can see Suzuki starting to play around with the approach that makes his better-known later films more interesting. The opening titles are placed over an arresting shot of a burning car; an apartment is decorated and lit in a peculiar mixture of green, yellow and red; and, best of all, the heroine explains her dire plight framed in a broken mirror. It may be a far cry from the delirious images of Tokyo Drifter, but Suzuki’s much-lauded style is here in embryonic form. Detective Bureau 2-3 Go to Hell Bastards! is released on Arrow Blu-ray.